This is the fifth year of the Bruce Museum’s participation in the Hour of Code movement. Hour of Code isn’t something invented by the museum. Rather, it’s a global initiative aimed at introducing as many students as possible to computer science. Why computer science? Computers have become part of the day to day life of many Americans. Reflecting this, the technology industry is constantly in growth, creating more jobs and more economic opportunities. A lot of new software engineers, computer scientists, and tech experts of all varieties are going to be needed in the next few decades to maintain this growth. The more students we can get excited about computer coding, the better. Maybe some will be building the technology of tomorrow! The Bruce Museum offers no-cost Hour of Code programs with a number of freely available websites and tutorials. Some tutorials, like those available on the Hour of Code website, offer a linear coding “game,” where students use blocks of code to direct characters to achieve certain objectives. 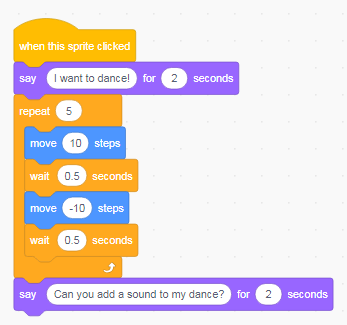 Our other main offering is coding using Scratch, a free-form programming language that allows students to code whatever they can imagine, be it a game, a story, or even a dance party with music. What’s better than a girl playing with one spinning “boark”-ing dog? A girl surrounded by a whole pack of them! That’s what one of our coding students decided this year, shown in the video above. After this year of Hour of Code, the Bruce Museum will have introduced over 3,500 students in local schools, scout troops, libraries, and community centers to computer science. Though our classes may be only an hour long, many students were enthused to continue their coding adventures and we’re sure they’ll have more hours of code in their future!